Recently it has gotten pretty cold here in Vancouver. It has been minus temperatures these past few days. Since its been pretty cold out I needed to wear some clothes that kept me nice and warm and this oversized sweater was perfect. I wore this black winter coat on top to keep me warm. And to complete the outfit I added this Crawford clan Tartan scarf that my sister Prabh bought from Scotland when she was traveling there. I also accessorized with my new mid finger ring from topshop. 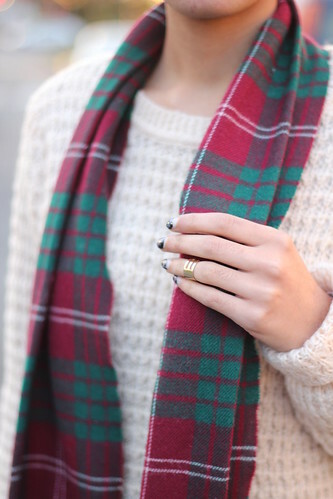 Your scarf and sweater looks so perfect together! You managed to stay beautiful with a winter outfit! It's freezing cold here in Seattle too!! Stay warm girls! Love your coat! It has been cold! Kind of fun with the snow too, wish we we had had more. You look so cute, I love your scarf! the scarf is too good.. lovely outfit. I love this! Still a little festive, but in the best way possible :) We all still need some good cheer around here even after the holidays! Love that coat!!! And ur scarf is soo cute! This is so pretty! love your scarf and sweater! 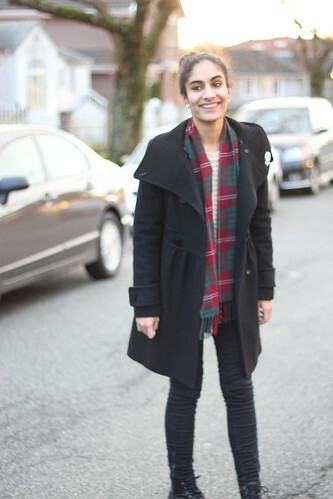 I love hat scarf - and that coat is really flattering on you. Quite a lovely winter outfit. 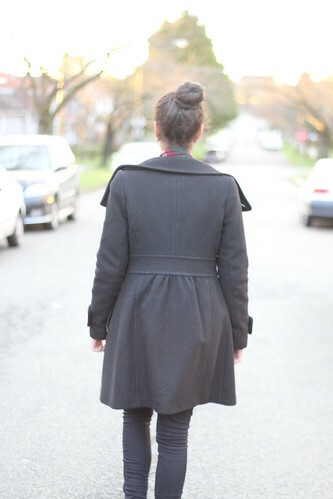 I am mad about the darling messy bun! You look so so stunning and adorable at the same time!